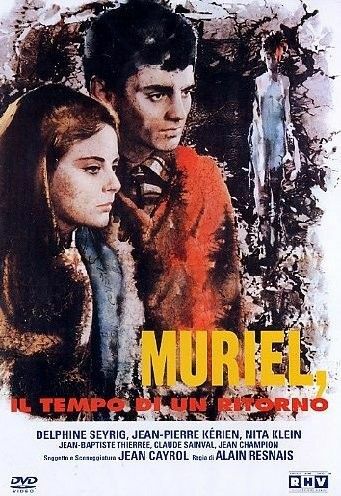 My first encounter with Muriel (and Resnais) came in the mid-1970s when I was a student at the University of California at Irvine. For some reason, this film annoyed me like almost no other. Resnais is a master at using editing in original ways and constructing intellectual puzzles out of his films, and this one really seemed almost beyond pretentious to me at the time. Today, I see the film as being much easier to grasp, although I still see it as a film for a highly-specialized audience. Resnais' trademark non-linear and even misleading editing is still on display here although the actual point of the film seems extremely clear to me now. Muriel was Resnais' third film (after Hiroshima, mon amour and Last Year at Marienbad) in a trilogy which highlighted rememberances of the past, and in some ways, although it's the fuzziest in its specifics, it seems the clearest in its intentions. Basically, the film takes place in rebuilt (after WWII bombings) Boulogne, France, where Hélène (Delphine Seyrig, made up to look about 20 years older than she was) greets her ex-lover Alphonse (Jean-Pierre Kérien) and his niece Françoise (Nita Klein) at the railway station and brings them back to her home/antique shop where Hélène's stepson Bernard (Jean-Baptiste Thiérrée) also lives. Both men have recently returned from Algeria although they never met each other there. This film is set during the Algerian Revolution, and Muriel is Bernard's fiancee who's never shown in the film.